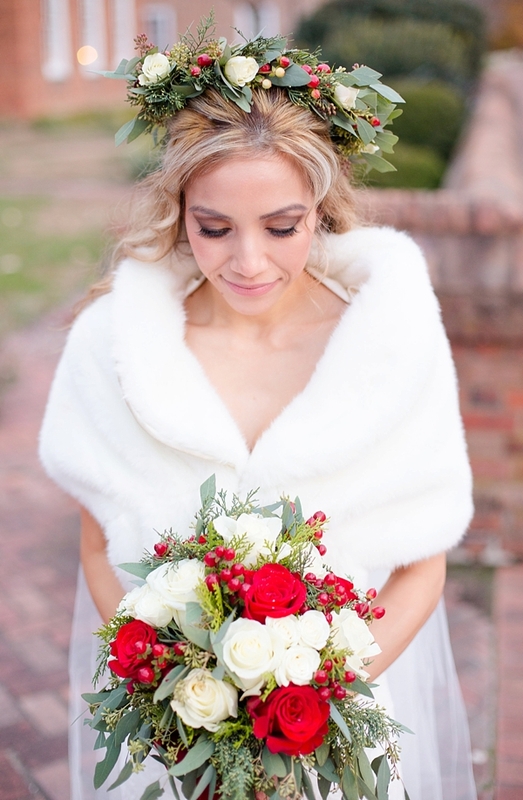 When a bride and groom says that they picked Christmas time to get married because "Christmas is a time spent with family and for all things merry and bright," our holiday hearts are like Frosty taking a nap in front of the fireplace -- melted and cozy warm. 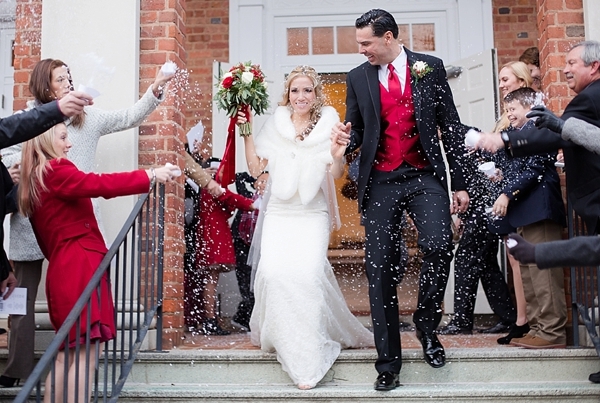 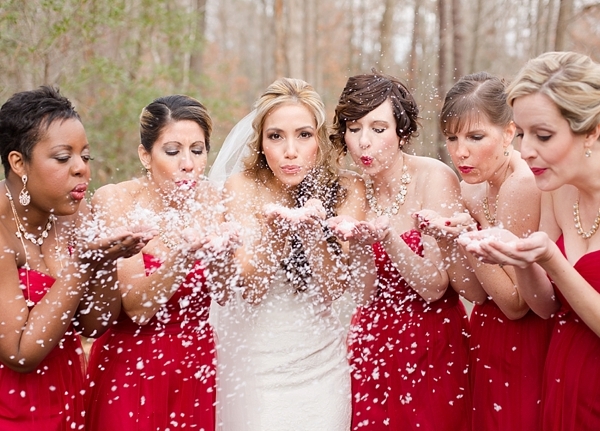 As huge winter wedding fans around here (with our editor-in-chief being a past Christmas bride herself! 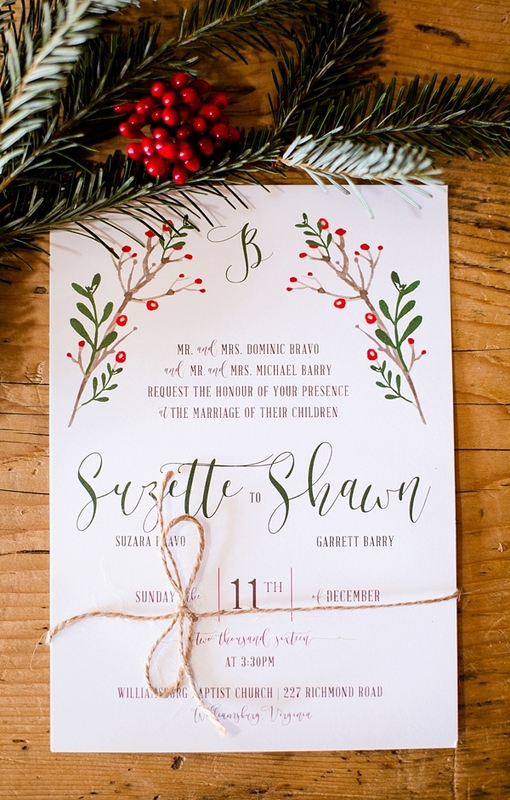 ), Suzette and Shawn's festive celebration gave us all the joy of the season! 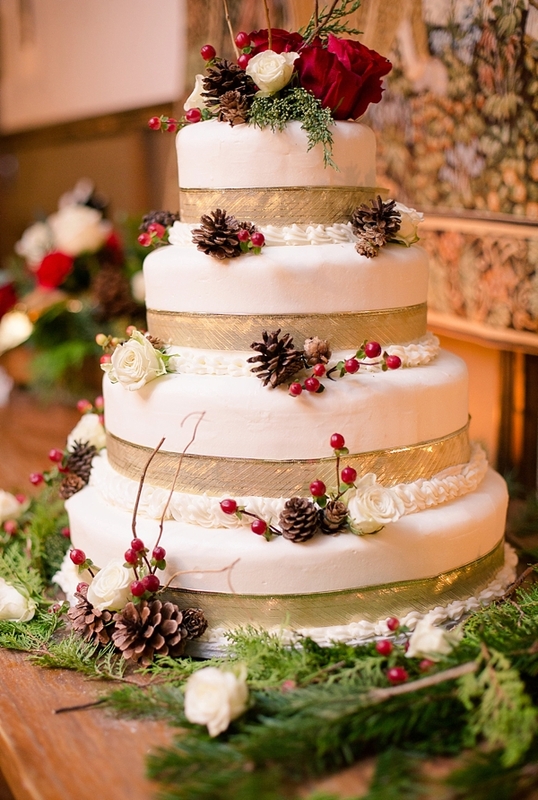 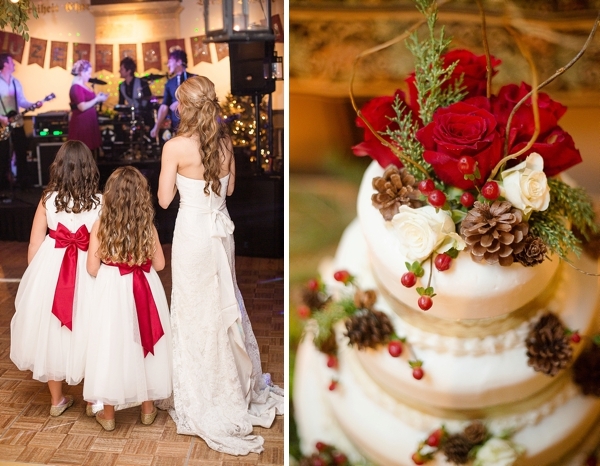 From holly berry red bridesmaid dresses to evergreen decor to eco-friendly snow confetti to pinecone-dappled cake, this wedding was Christmas personified as captured by Katherine Sparks Photography. 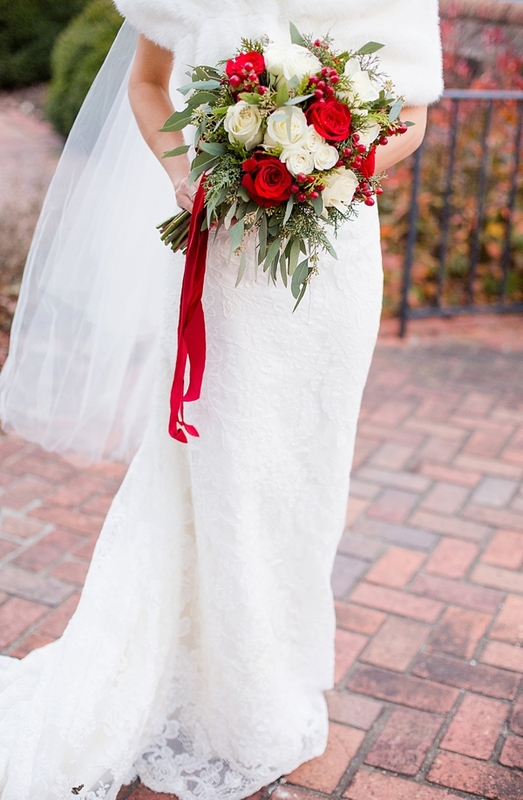 The couple chose a traditional church ceremony (where the bright red aisle carpet actually is perfectly matched to the wedding theme!) 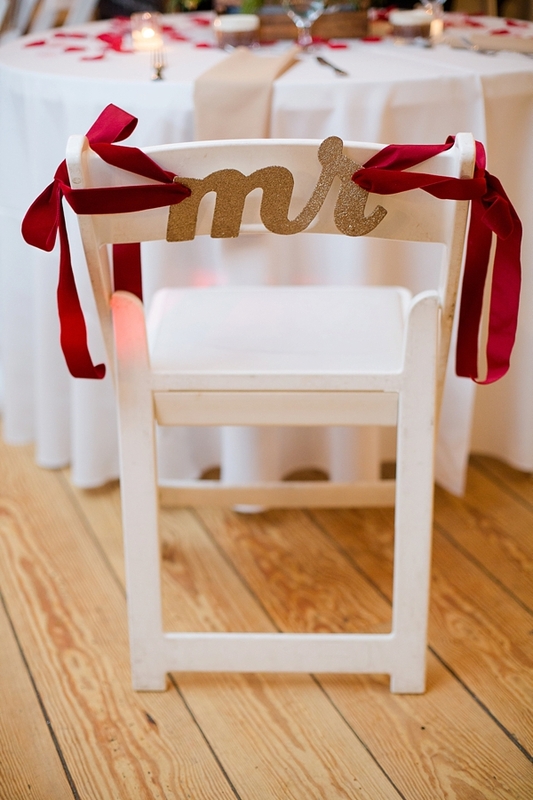 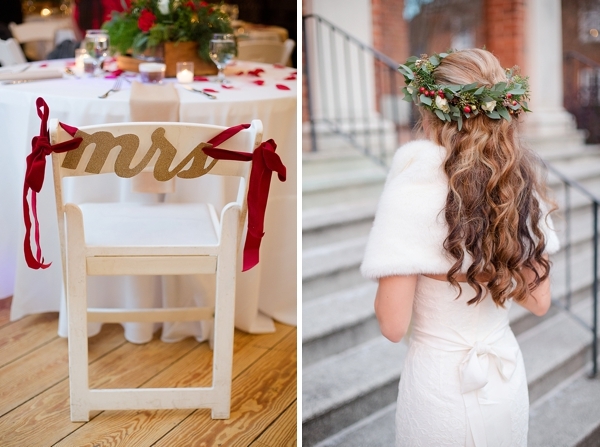 with a rustic reception at the Williamsburg Winery that dazzled their guests with a holiday wonderland. 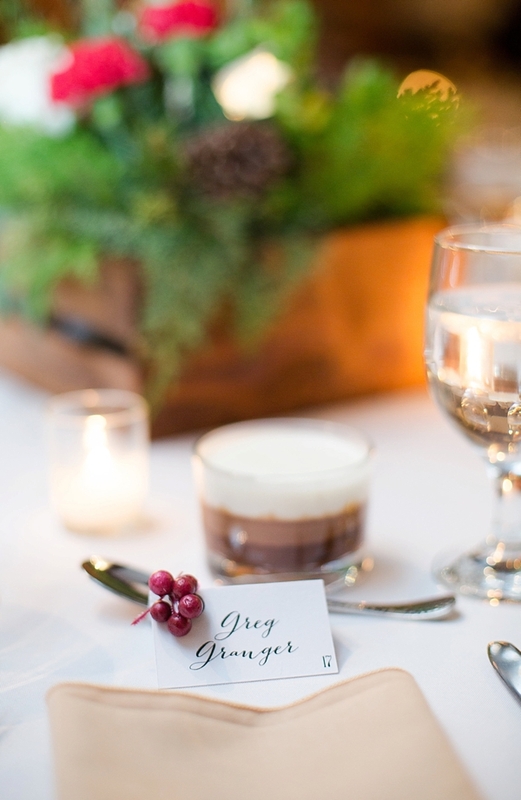 To help make this vision a reality, every detail of their wedding reception involved all the love and help from Suzette's friends and co-workers. 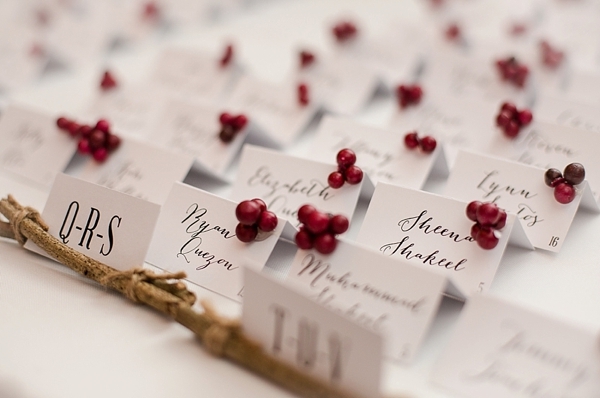 During lunch breaks, they would all work on wedding details -- from designing to hot gluing! 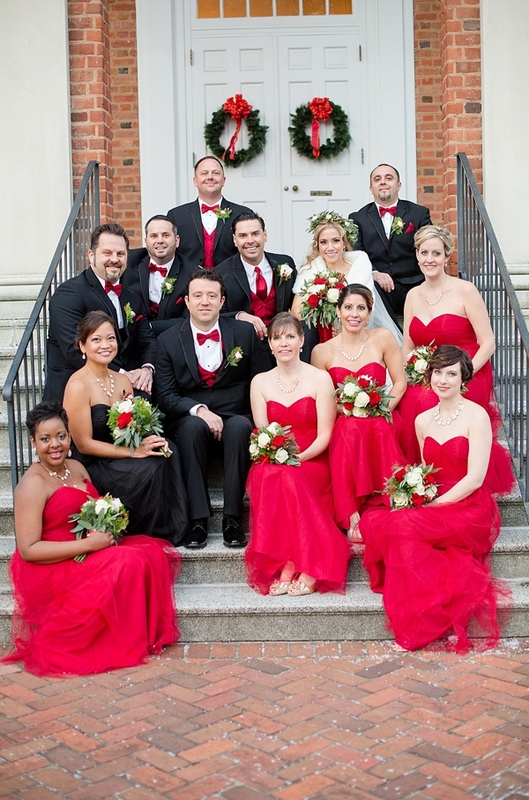 'Tis the season for giving, and this whole crew definitely gave it in the true spirit of Christmas. 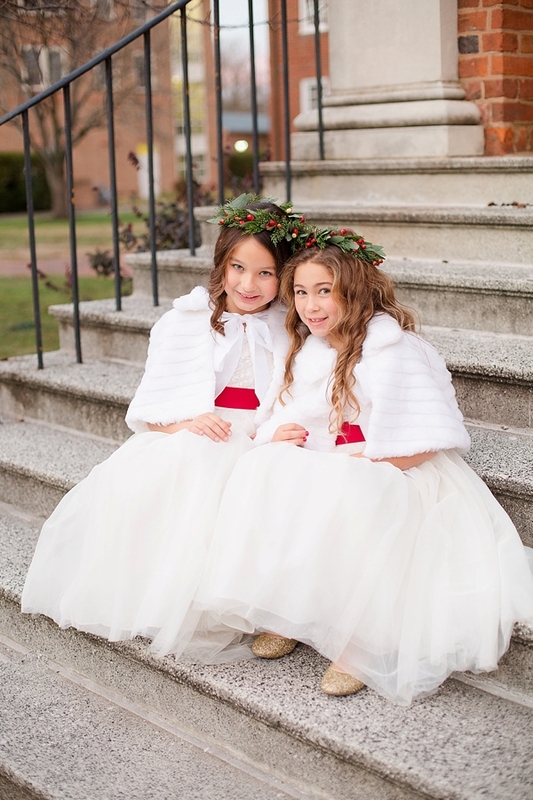 Suzette and her ladies were beautiful visions of sugarplum fairies and all things lovely in their faux fur stoles, glittery gold shoes, and romantic floral halos while the groomsmen (and groomslady!) 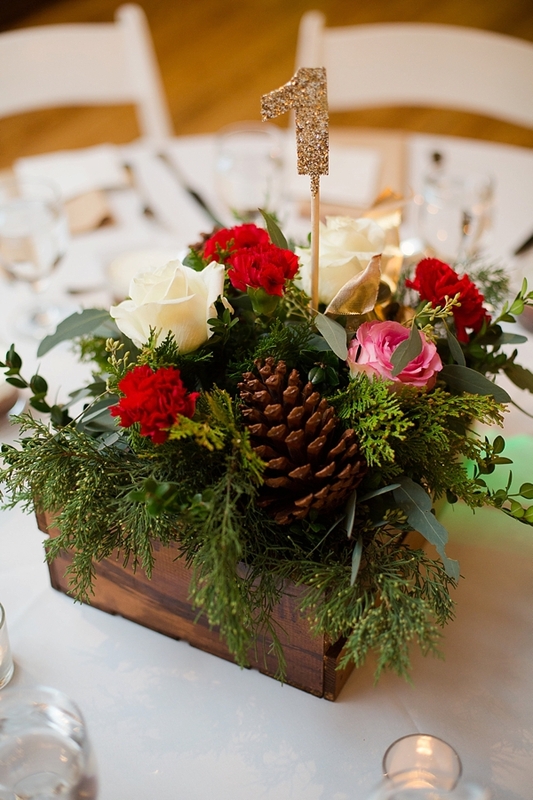 were dapper in classic black suits and dress that complemented the classic Christmas vibe for the whole day. 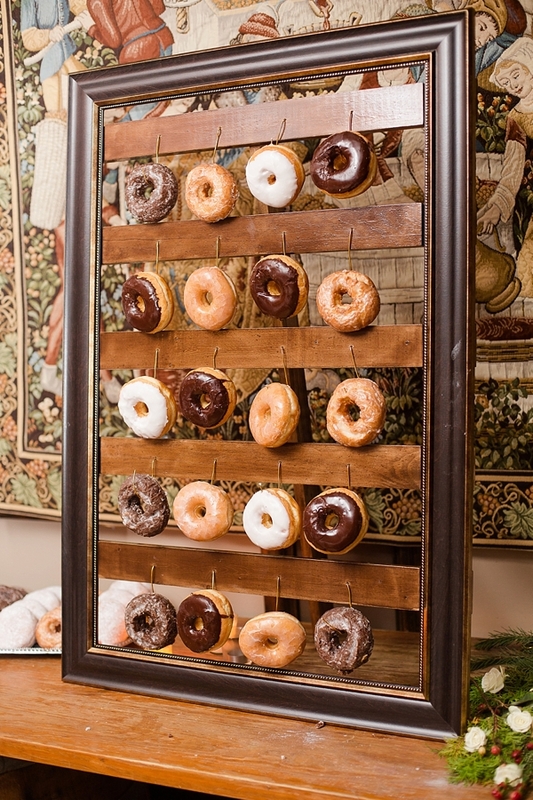 We're not sure what we loved most -- the red velvet bouquet ribbons, the greenery draped chandeliers, or the late night snack hanging donut frame! 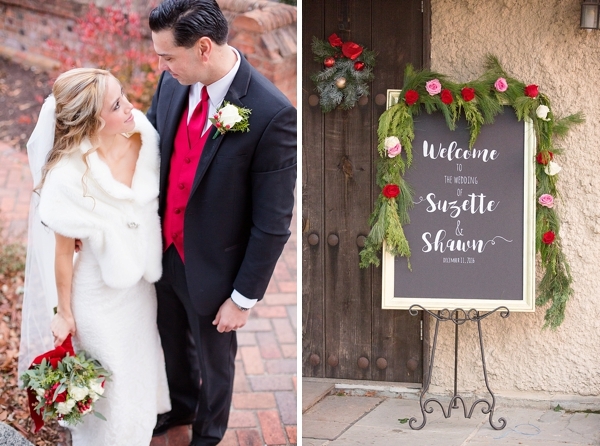 Either way, Suzette and Shawn's magical December day has us all dreaming of a white Christmas filled with hot cocoa, carols, and good cheer!